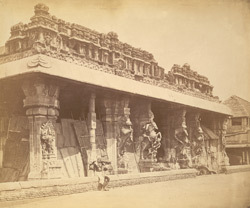 Photograph of the entrance of the Pudu Mandapa, Minakshi Sundareshvara temple taken by Nicholas and Company c.1882. The Minakshi Sundareshvara Temple is dedicated to Shiva and his consort Minakshi, an ancient local divinity. The construction of this imposing temple-town was made possible by the weqalth and power of Tirumala Nayak (1623-1659). The rectangular precinct covers six hectares and has eleven huge towers and four entrance gopurams. The Pudu Mandapa is situated in front of the east gopura and consists of a long hall with piers carved with yalis, mythical lion like creatures and portrait sculptures of the Nayaka rulers. This is a view facing the entrance to the mandapa, the yalis can clearly be seen attached to the columns and the temple appears to be in a poor state of repair.